In his report today about the NBA Labor situation and the dire position the two sides are in, J.A. Adande made reference to the fact that Cavaliers owner Dan Gilbert is involved in the negotiations with Billy Hunter and asked him to "trust his (Gilbert's) gut." 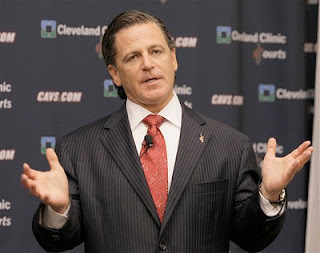 You know a deal is nowhere close when the owners' side has Dan Gilbert telling the players to trust him. Yeah, that'll work. It's the same Dan Gilbert who went from sweet-talkingLeBron James and offering him $125 million to shooting arrows at his back after he left. Put it this way: How seriously would the owners take it if LeBron came into the room and told the Cavs' owner to take the players' proposal and trust him on it? One of those parties tanked a playoff game for still-mysterious reasons and caused his #1 seed team to fail spectacularly, and then pulled the ego trip of a lifetime in order to add more pain to a community which he knew was long suffering. The other one fired off a bitter, knee jerk, comic sans open letter in the heat of the moment. What on Earth do those two things have to do with each other? I know which one I'd trust more. Now I'm no billionaire-lover. I would guess that Dan Gilbert and I have different views on tax policy (he might be gaga over Herman Cain's 9-9-9 plan, as it would save him many many many millions.) But little digs on Gilbert from player (read: LeBron)-favoring columnists just aren't right. And it seems that our old friend Brian Windhorst got into the game a little bit today too, with a column about Gilbert's business dealings and the casino he is building in Cleveland. Although he doesn't outright accuse Gilbert of not caring about the Cavs, and only using the James-powered team to build his own business interests, he comes pretty close. Give me a break. Gilbert (as Windhorst admits) tried incredibly hard to re-sign James. And the fact that Gilbert is a businessman and is trying to make money at it doesn't mean it's necessarily a "hedge" against James leaving. Don't you think the casino would make even more money if the Cavs were winning 60 games a year? Not sure where this sudden PR push against Gilbert came from, but it seems disingenuous at best.